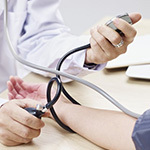 MONDAY, March 28, 2016 (HealthDay News) -- Keeping track of your blood pressure at home may provide a better indicator of your risk for heart disease and stroke than waiting to have it taken by your doctor, Japanese researchers report. The study found the risk for heart disease and stroke was greater for patients whose morning systolic blood pressure -- the top number -- measured at home was 145 mm Hg compared with reading of less than 125 mm Hg. "In clinical practice, morning home blood pressure may predict heart disease and stroke better than office blood pressure, and be more effective in managing high blood pressure," said lead researcher, Dr. Kazuomi Kario. He's a professor and chairman of the division of cardiovascular medicine at Jichi Medical University School of Medicine in Tochigi, Japan. "Few reports have investigated the predictive ability of home blood pressure for heart disease and stroke," Kario said. "This largest home blood pressure study is the first to demonstrate that morning home blood pressure may be superior to clinic pressure," he said. For the study, Kario and his colleagues followed more than 21,000 patients with high blood pressure for a little over two years. The mean age of the study volunteers was 65. During the study follow-up, 127 patients had strokes and 121 developed heart problems, the findings showed. Strokes were significantly higher among those patients with a morning home systolic blood pressure of 145 mm Hg or higher, compared to those patients whose systolic blood pressure was less than 125 mm Hg. The comparable numbers for stroke risk measured in a doctor's office were 150 and higher, and less than 130, respectively, the researchers found. The risk for heart disease was also higher among patients whose at-home systolic blood pressure was over 145 mm Hg compared to those who had blood pressure of 125 mm Hg or less at home. For the in-office reading, risk for heart disease was greater when blood pressure was 160 or higher compared to less than 130, the investigators found. The report was published online March 28 in the Journal of the American College of Cardiology. Elevated blood pressure remains a leading cause of stroke, heart attacks, heart failure, kidney failure and premature deaths, said Dr. Gregg Fonarow. He's a professor of cardiology at the University of California, Los Angeles, and a spokesman for the American Heart Association. Taking your blood pressure at home is relatively simple using a blood pressure measuring device. Devices are available in drugstores and other stores, and range in price from around $30 to more than $100. The American Heart Association (AHA) recommends an automatic, cuff-style, upper-arm monitor for use at home. Wrist and finger monitors are not recommended because they yield less reliable readings. Monitors for the elderly or pregnant women should be validated specifically for those purposes. And, be sure the cuff fits properly, the association says. Blood pressure responds to many factors and will vary throughout the day, so a single high blood pressure reading is not an immediate cause for alarm, the AHA points out. But if you get a high reading, you should take your blood pressure several more times and consult your doctor to make sure you don't have a problem and that your monitor is working properly, the heart group recommends. Controlling your blood pressure should be a partnership between you and your doctor, the AHA suggests. Taking your blood pressure at home is one step, and should be done with the advice and help of your doctor. "There is increasing interest and guideline recommendations toward using blood pressure readings taken at home to assess risk and guide treatment of hypertension [high blood pressure]," Fonarow said. "The lower the morning home blood pressure reading, the better the outcomes," he explained. Men and women with a morning systolic blood pressure reading of less than 125 mm Hg had the lowest rates of cardiac events and strokes, Fonarow said. "This study lends further support for integrating morning home blood pressure readings as a component of the routine clinical assessment and treatment of high blood pressure," he added.